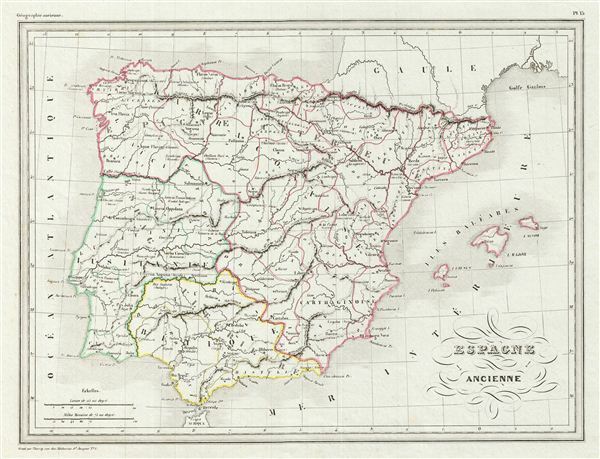 This is a fine example of Conrad Malte-Brun's 1843 map of Ancient Iberia or Spain and Portugal. The map covers all of Iberia under the Roman Republic from the Atlantic Ocean to the Mediterranean Sea. This includes Hispanic Citerior or Tarraconensis, consisting of the Baetica, Lusitania and Carthaginensis. Although the Romans controlled most of the Iberian Peninsula from about 218 BCe, it took them close to two centuries to fully subjugate the region. Various cities, towns, rivers, islands and other topographical details are marked, with relief shown by hachure. Boundaries are color coded according to regions and territories. This map was issued as plate no. 37 in Conrad Malte-Brun's 1843 Precis de la Geographie Universelle.